This column really should have a subtitle to it: "Part 4 of Chris' Adventures At The Inauguration." I have been reporting my experiences of attending the Inauguration in a series of articles this week, and since I am going to devote the talking points to the best, most memorable lines of President Obama's Inaugural speech, this really should be part of this series. Sunday -- "As I Went Walking That Ribbon Of Highway"
Monday -- "The Day Before The Big Day"
Tuesday -- "Twenty-One Howitzer Salute"
Wednesday -- "'I Was There!' -- My Experience Of The Inauguration Of President Obama [Parts 1 & 2]"
Thursday -- "'I Was There!' 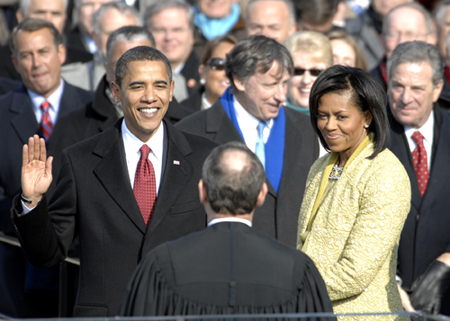 -- My Experience Of The Inauguration Of President Obama [Part 3]"
Which brings us up to today. Tomorrow, I will post the final installment on my website, so check back if you want to see how it all turns out. But before I begin, I have a mini-story to tell. The coolest thing that happened to me was completely unrelated to the event itself. I got to sit in the captain's chair of the airplane we flew home on. Parked at the gate, with time to kill, the crew came out and was chatty, so I asked if I could see the cockpit. I just wanted to duck my head in and marvel at all the techie stuff for 15 seconds, but the copilot insisted I sit down in the empty captain's chair. He then took five minutes or so to point out all the cool instruments and what a great view they had from up there, and answered all my questions. Even when I was a little kid, back when they let you go in the cockpit while in flight (if your parent asked), I never got to sit in the main seat. So I apologize for behaving as if I were eight years old, but man, that was cool! Enough of that. Let's get the awards out of the way with, and then get on to Barack's speech [much like learning to write a new year on your checks, I'm still getting used to saying "President Obama" or "the president," but I'll try to get more in the habit of doing so, I promise]. There were two groups of individuals who were disappointing during the Inauguration. The first is the congressional committee who was in charge of the event. While each of them deserve a Most Disappointing Democrat Of The Week award (at least, the Democrats among them who qualify), we are already handing out two awards this week, so the statuette will have to go to the committee's chair, Senator Dianne Feinstein. About the best thing she did was manage to get a few California acts prominently featured (the San Francisco Boys Choir and San Francisco Girls Choir, and the only middle school band to march in the parade, Saratoga's Redwood Middle School Marching Band). I don't have a problem with that sort of state boosterism, and as a Californian myself felt great civic pride in the kids who got the experience of a lifetime by participating in the Inauguration. What I do have a problem with is the way the event was handled. The problems were many, and I have detailed them in earlier articles this week (see links at top of this column). They were too many, frankly, to list here. But the biggest problem was crowd control. We weren't an unruly crowd, quite the opposite. Among 1.8 million people, not a single one got arrested for anything. But there was seemingly no "master plan" to deal with us. It's not like they didn't know we were coming. Estimates of the expected crowd size before the event ran from one million to five million. And yet, they blew it. I was among the lucky, and viewed the event from the Mall, between 6th Street and 7th Street -- a prime location. But the sheer cluelessness and ineptitude I had to avoid from the security forces was astounding. It's not that they weren't trying to do the best job they could in a difficult situation, it's that there simply was no master plan for them to follow. In the days leading up to the event, there was a lot of detail about the parade route, including what you could and couldn't bring, where the security would be set up -- helpful details to plan your day. But although it was obvious that most people would be on the Mall, there was absolutely no information about how to get there, where to go, when to go, and what you could and couldn't bring. Nothing. The only advice given out to the public was "tents for overnight camping will not be allowed." That's it. When exiting the nearby Metro stations, there was no information for the crowd whatsoever. Getting through the fences and onto the Mall was complete chaos. Some places, the cops would not let anyone through, some places they were letting people in, and in some places they were non-existent. None of the cops had any information, and even if they did they were not sharing any of it with the crowds. This all could have been averted by about two officers at every major point (Metro exits, Mall entrances) with bullhorns telling the crowd what to do. That's all it would have taken. We would have cheerfully followed any directions given. The problem was, there was no directions at all from anyone. In other words, no master plan. And that's just for the public areas of the Mall itself. People who had tickets -- thousands upon thousands of them -- were also denied entry at several locations. They did what they were told to do, lined up where they were told, and they just did not get in. No master plan at all. Now, Feinstein has called for an investigation of what went wrong. If you were there and have a story to tell them, or some advice, use the email address below to let them know. Hopefully, they'll get the message. But this locking of the barn door after the horses have fled isn't good enough for Dianne Feinstein to avoid her MDDOTW award. Because she spent all her congressional efforts, and assumably a lot of time and attention, on making it against federal law to sell Inauguration tickets. That was her main worry. So my suggestion is: next time, spend the same amount of time and effort on a master crowd control plan before the event, and don't worry about a little free enterprise with the tickets. Which is why Dianne Feinstein gets a Most Disappointing Democrat Of The Week award (her fifth, I should add). She will have to share her award with another group of people, though. Because there's another group comprised mostly of Democrats (one would assume) who need singling out here as well for behavior not just disappointing but downright rude and disgusting. I looked for an image of this, but could not find one in the short time I had, so feel free to post a link if you've got one. But on television Tuesday night (I attended the swearing-in but not the parade) was an image of Barack and Michelle Obama standing virtually alone in a reviewing stand. The story was that the Obamas stayed until the end of the parade to watch every single participant, but the sea of empty chairs behind them spoke for itself. Nobody in the VIP reviewing booth but the Obamas stayed for the end of the parade. Now, the parade did start late, but even so, there is simply no excuse for this. Two million people nearly froze waiting to see this day, and the dignitaries couldn't be bothered to sit in a heated booth to watch the entire parade. I guess they had to rush off to change before their Inaugural Ball appearances or something. How would you have felt if your kid's marching band got the honor of appearing in the Inaugural Parade, and was met by an almost-empty booth at the end of it? Significantly, the seat behind the Obamas was clearly labeled as reserved for "Senator Feinstein." Meaning we don't have to send out two statuettes after all, as the single Most Disappointing Democrat Of The Week award winds up doing dual duty for both groups of Democrats this week. And since Feinstein is so prominent in both groups, she herself gets the award. Was that a speech, or was that a speech? Conservative columnists have been trying to detract from President Obama's first speech to the nation by calling it various things in an attempt to slow down the Obama momentum, but my guess is that history will remember it differently, and their tawdry efforts will be seen as the sour grapes they truly are. Other conservatives are trying a different spin, saying because Obama mentioned "hard work" that it was really a conservative speech in some sort of liberal disguise. Oh, puh-leeze. Since when has hard work been the sole property of conservatives? Liberals don't work hard? Give me a break. Because Obama's Inaugural speech was indeed masterful. When he started speaking, I was thinking "which line will be the one everyone focuses on?" In other words, which line will be the "nothing to fear but fear itself" or "ask not what your country can do for you, ask what you can do for your country" moment? Both of those lines are from previous inaugurations, so what would be remembered from Obama's speech? But I ran into a problem. There were just too many lines of that nature in one single speech for me to keep count of them all. The entire speech's text is well worth reading, even for those who have already heard it on television. It is a stunning call for America to return to greatness. It was virtually impossible for me to pull only seven things out of the speech worth quoting by future generations. My initial impression while I was listening to the speech was to notice the way Obama used phrase after phrase to say essentially the same thing: our long national nightmare of the Bush years is over. We will change, and it will start today. It's a new day in America. Here are some of the phrases Obama used to draw such a bright line between Bush's administration and what Obama is going to do with his: "failure to make hard choices and prepare the nation for a new age... we have chosen hope over fear, unity of purpose over conflict and discord... On this day, we come to proclaim an end to the petty grievances and false promises, the recriminations and worn-out dogmas that for far too long have strangled our politics.... our time of standing pat, of protecting narrow interests and putting off unpleasant decisions -- that time has surely passed.... Starting today... begin again... we reject as false the choice between our safety and our ideals... we are ready to lead once more... What is demanded then is a return to these truths. What is required of us now is a new era of responsibility." Over and over again, the continuing theme of: America will start living up to its ideals... once again. I strongly urge you to take the time and read the speech in full. Because these seven snippets just don't do it justice. What I have selected (they are arranged in the order in which Obama spoke them during the speech) are the seven things most likely to be quoted in the future (and already are being quoted by journalists). Not my favorite lines, or the most important lines, just the ones that I think will be remembered by history. These are all taken straight from the transcript, and no further commentary by me is necessary this week. We are the keepers of this legacy, guided by these principles once more, we can meet those new threats that demand even greater effort, even greater cooperation and understanding between nations. We'll begin to responsibly leave Iraq to its people and forge a hard-earned peace in Afghanistan. Hi Chris, great site, I am glad you made it to the Mall to see the great event because I can experience it vicariously through you. What a complete shambles!! We had to watch the swearing in through the window of the Green Turtle bar because we were not able to get to the mall, along with thousands of other people. We listened to Obama's speech on a car stereo turned up loud so a huge crowd could hear. Why were the crowds not funnelled from the Metro to the Mall where we would be contained and somewhat controllable. Instead thousands of people wandered from roadblock to roadblock for hours trapped in a huge maze, missing the whole thing we went to D.C. to see. A once in a lifetime experience was destroyed by outrageous incompetence. I hope a better plan is in place 4 years from now because I will be back to see Obama 2!! I strongly urge you to write to the email address below the "Most Disappointing" section of this article and let them know your experience. I would include the streets you were on, the Metro you took, and where you were denied entry. The fiasco of the crowd control has got to be addressed, so they do a better job next time. On the good side of things, the Metro seemed to do a bang-up job of getting people there and back. They had a record day of over one million riders, and we experienced some crowds, but no real problems. But seriously, you or I could probably have come up with a better crowd control master plan in about ten minutes. How about - shut down each section of the Mall when it fills, moving westward from the Capitol, and then tell the cops at the newly closed entrances to redirect people further west to get in. See? That wasn't that hard to do. Oh, and give the cops at each intersection radios and bullhorns. And keep them informed. Wow, that didn't even take ten minutes. More like thirty seconds. Anyway, you can still say "I was there" and that's what is important. I would be willing to bet there was half a million to one million people who were there, but didn't make it to the Mall to see it. Meaning the total crowd could have been closer to 3 million than 2. Anyway, thanks for writing, and check back here later today for "Part 5" where I finish the story up.